Swarovski includes product literature with probably all new crystal. That being said, when items are purchased from retailers, it is possible for the literature to fall out at the store before it actually safely arrives to a collectors home and display cabinet. For this reason, as a professional secondary market dealer of retired Swarovski, we're not making a firm statement that Swarovski certificates were or are included with EVERY piece of crystal. The question that so many Swarovski collectors have is "Just how important are the Swarovski Certificates?" The answer to that question depends on the Swarovski crystal piece in question. If the Swarovski crystal is an Annual Edition, Limited Edition, or Numbered Edition, the Swarovski Certificate of Authenticity is extremely important. 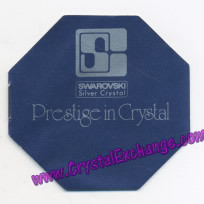 For all these types of pieces, the Swarovski certificate is specific to the item. This means that you cannot swap them from other pieces, for example, the Lovebirds certificate and the Woodpeckers certificate cannot be interchanged. In the case of the numbered editions, the Swarovski certificate most likely contains the edition number and must match the edition number on the crystal. 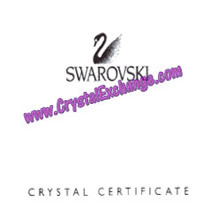 If the Swarovski crystal is an item from the Silver Crystal product line, or any other Swarovski product line for that matter, the Swarovski certificate is generic and can be switched from other crystal in the same product line. While the literature states "Certificate", in reality, it is product literature advertising other crystal that the company produces and sells. 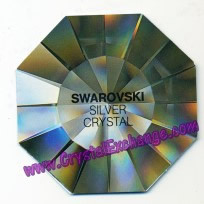 Below are pictures of some of the many Swarovski certificates that the crystal company has used for the Silver Crystal product line since 1976. Swarovski collectors ask us what is the Swarovski COA? Is the Swarovski COA different from Swarovski Certificates? 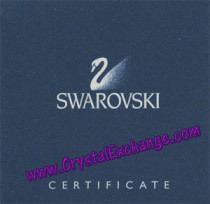 Swarovski COA is an acronym for Swarovski Certificate of Authenticity. When referring to Swarovski crystal collectibles, many collectors refer to the generic booklet as the Swarovski COA. After all, starting in 1988, the booklet does say 'Swarovski certificate' on it. 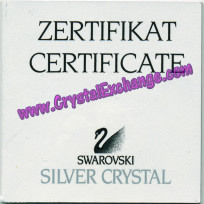 While the literature includes the word 'certificate' on the front, in reality, it is product literature advertising other Swarovski crystal figurines manufactured by Swarovski. Some Swarovski crystal fanatics collectors are adamant about having the Swarovski certificate with each and every pieces in their collection. When they purchase retired Swarovski from us, they WILL spend extra money to ensure that the product literature is included with the crystal. We've seen collectors pay as much as $30 extra for a Swarovski certificate to be included in their Silver Crystal product purchase! In our online store, to be certain that a certificate is a part of the purchase, make sure that the product details page states: Generic Booklet : Yes . The majority of Swarovski collectors would like for Swarovski certificates to be included with their crystal. However, the bottom line is that they will not spend extra money for the literature. Looking at our sales history at Crystal Exchange America, we do NOT find that Swarovski certificates add a premium to the crystal. On the whole, sellers who have Swarovski COA do not receive higher prices as compared to sellers who honestly state that generic booklets are not included. In the end, it is a personal decision on whether or not you go that extra mile to have the Swarovski Certificate of Authenticity for your figurine. 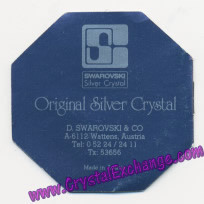 Realizing that we do not see crystal command higher prices with the Swarovski certificates, we certainly would not recommend spending the extra money thinking that it is a good investment.